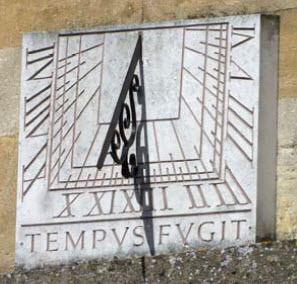 Why should there be two nearly identical and remarkably accurate, sundials in a small Oxfordshire town? Walking into the lovely Market town of Woodstock in Oxfordshire by either of its entrances from the main road, is always delightful. 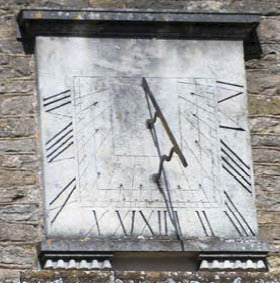 On Woodstock Town Hall there is a dial which is carved into a block of white stone or perhaps marble. It was way back in 1998 that dial enthusiast Anthony Capon first drew attention to the fact that the Town Hall dial was unusual in that the block is placed on a ledge and turnedor canted, to make it read correctly. The suspicion then was that it was a dial that had been made for another location. along the noon line. Therefore the dial was constructed as one that declines, in this case to the West and apparently then turned to make it read correctly. The plot thickens. There are only a few other vertical declining canted dials known in the National Sundial Register so it would be nice to find the explanation. The answer might just possibly be only a short distance away at the back of St Mary Magdalene's Church in Woodstock where there is a similar, older, larger and very well made dial. The Church was built in the 12th century, in the reign of King Henry II, as a Chapel-of- Ease to the Parish Church of St. Martin, Bladon. It was probably constructed for the convenience of the Court since the King was often in residence at his Royal Manor of Woodstock. Long after the church was built – though when we do not know – the sundial was installed, It was moved to the West in the 19thC after some emergency building works and there it remains to this day. It only takes a moment to realise that the Town Hall dial is a near complete copy of the St Mary Magdalene dial (even down to its backward lettering for 7am and 8am!) rather than one delineated for its location. In fact this copy is probably relatively modern. It is known only from the 1950s and was 'redrawn' in the early 1990s. See what you think from the pictures here.